In Germany there is a 5kgs limit for commercial general flight license. It would be a no brainer to get this Micro cam on a drone and stay under 5kgs. The Phantom2 GoPro has about only 1,3kgs. I always wondered why there was no manufacturer who filled this gap with a better camera than the GoPro or Phantom Vision. I guess the question now is ,can the phantom fly this and a light wide pancake lense and if yes for how long ,I guess we shall find out . 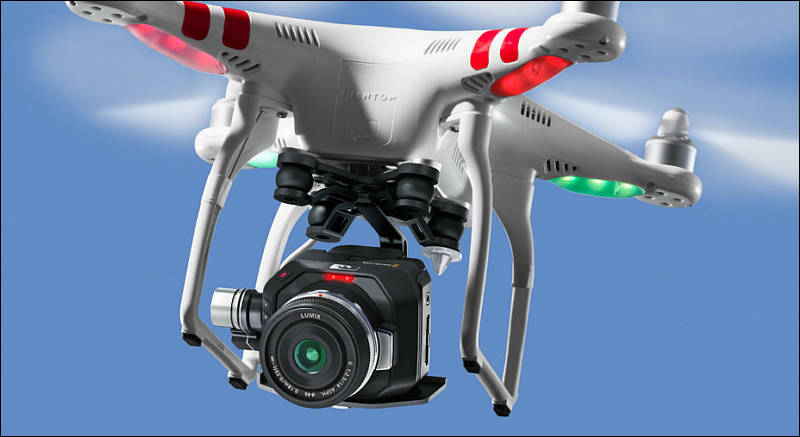 Action and drone cameras are best sectors in camera shipments. All major manufacturers working on offerings. the old pickle in the salad is....drone cameras want wide angle....and how you going to get wide angle on a s16 sensor ? The samyang 7.5mm is about all there is ....light enough for flying. Our Pocket Cinema Camera has been popular because it’s an incredibly tiny digital film camera that’s super portable. It does not even look like a digital film camera! It’s a great handheld design, however, it’s also been used for shooting remote shots and it was not really designed for that. So we have been working on a digital film camera that’s specifically designed for remote shooting, and it’s even smaller! The result is the Blackmagic Micro Cinema Camera, which is a miniaturized Super 16mm professional digital film camera with a new expansion port that lets you use PWM and S.Bus model airplane remote controls to operate the camera wirelessly for capturing action anywhere. What this means is you can use the same low cost radio control gear that hobbyists use for model aircraft and quadcopters. Normally these receivers plug into “servos” which generate movement when the user adjusts a knob on the hand held transmitter. These connections use a voltage called PVM and we have the same connection on the Micro Cinema Camera. So this means you can plug into the camera and control the camera remotely. You can even map what camera feature you want on what channel. So you could map the lens to adjust iris or focus. You could use a channel to start and stop recording, so you don’t fill the SD Card with RAW or ProRes files before you are ready for your shot! To see what the camera is doing, it has a full sized HDMI connector and it even has composite NTSC/PAL out so you can use a low cost hobbyist video transmitter to see what the camera is doing and confirm its recording. Imagine having live feeds back from the camera when its in all kinds of hard to reach locations. I think its going to be exciting to see where this camera is mounted and what kinds of shots it gets. Because it has an MFT lens mount you can put all kinds of really professional lenses on it, and adapt it easily to other lens mounts. On this camera we even put the buttons on the front of the camera so when it’s mounted on a wall or in a car, you can just start recording from the front. It also has a tally light on the front so you can see if its recording. Image quality wise, its a true digital film camera because it has a wide 13 stops of dynamic range. This means it’s a big improvement in image quality over consumer “action-cam’s” so you can get all those high energy shots, without the consumer look. The Blackmagic Micro Cinema Camera will be available in July for $995. The SpeedBooster isn't that much additional weight. Couple that with a modern, plastic-y pancake and you've overcome the S16-ness for not much additional weight, perhaps. Most likely anyone who really, truly needs good looking footage is going to be using a beefier drone than a Phantom anyhow so this would be the next class up from folks getting by with 60Mbit 4K. I think there might be a bit of a spike in angenieux 5.9mm lens prices on ebay when this cam starts shipping! does the existing BMPCC Speedbooster work on it (I guess so, sensor sizes seem to match)? can you Genlock one cam directly to the other for 3D (ideal), or do you need an external sync generator driving both? same or improved colour & noise performance over BMPCC? I'm not the "fanboy" but I really love this company. They build stuff that's logical and often inspired instead of appearing like the product of some committee trying to please another committee of advertising execs trying to please another committee of accountants. LP6, duh! Not even proprietary but what will the stockholders say! Global shutter. Again Duh. Shouldn't every company make that a goal for action cams. Full sized HDMI. Someone paid attention to the user base! 1080P Most of us really DON'T need 4k. A 2k option for cropping. might have been nice but for most users a RAW workflow oughta not require a bank of servers.. Agreed @Leto. I would like 4K, but how are they going to record it internally? We can barely get 1080p RAW on a high-end Sandisk card. And there's no room for an SSD in that form factor. It's just not practical yet. Also I just heard from someone that asked about the other Micro 'Studio' cam at NAB (which is 4K but has no internal recorder), and was told it's DR and sensitivity are way lower (quote was 8-10 stops, native ISO ~320). So this is not a Cinema camera. At this level, the choice is between resolution or pixel quality - I'd like both, but I'll pick quality. I'd already be impressed if they can get 13 stops out of the Global shutter mode. The only other fatal flaw of my Pocket cams is the aliasing (often no problem, but not ideal and sometimes terrible). I suspect the Micro Cine will be the same, but an AA filter would make it perfect. @_gl agree 100%. I really want to preorder this camera but I wasn't happy with the aliasing and grid pattern problems of my BMPCC. Ended up selling it. I'm going to wait and see footage from this Micro Cam before ordering. Looks promising though! @aaronchicago right that's my dilemma too. It's almost too good to be true for 3D use (my use case), genlock, global shutter etc. But I got my 2 BMPCCs in a sale, so it's quite an extra outlay even after selling them.